The Delmarva Improv Group will play at Dickens Parlour Theatre April 12-13. 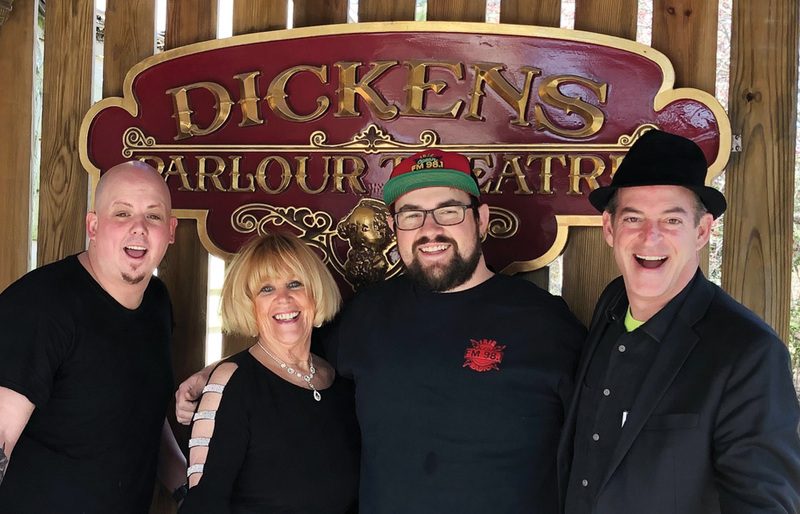 The Dickens Parlour Theatre in Millville on April 12-13 will host the Delmarva Improv Group, performing live stand-up comedy and an improv show. “The show is similar to the popular television show ‘Whose Line is it Anyway,’ with Drew Carey,” representatives noted. The cast will entertain and use audience input to develop funny scenes off the cuff. “We’re excited to invite comedy to the Dickens, especially now that we all need a good laugh, given all the political mess we hear on the news every day,” said Cheryl DeBois, manager of the theater. • Stevie Jay, a local emcee and host entertainer, who is a business developer at Community Integrated Services, MC/account manager at Triple B Entertainment and a former bartender at Bethany Blues of Bethany. • DJ Magellan is a DJ around Delmarva and radio DJ/producer at Ocean 98.1—WOCM. He works at Seacrets in Ocean City, Md., among others. • Ruthie Parramore is known in the area from Ruthie’s Bethany Bakery, and a former Best Bartender in Delaware at the Starboard, and hostess at Bethany Blues, 99 Sea Level and The Parkway, to name a few. She’s performed in many productions at Dickens and did stand-up with Ronnie Dove. • Bob Kemp is known as “the wacky white guy” on the commercials for Holly Kia, where he sells cars for a living in Selbyville. He was a professional actor in Los Angeles and Miami, and has performed in five different shows at the Dickens. The group began performing two months ago to sold-out crowds at Mio Fratello’s in West Fenwick, where they continue to perform every other Friday nights at 9:30 p.m. Tagged as adult-only — the comedy is unfiltered and raw, DeBois noted. They have been featured on the morning radio show Ocean 98.1—WOCM and also on “Coastal A&E” with host Michael Sprouse on Delaware 105.9. “It’s promoting the good old fashion belly laugh,” Parramore said during her radio interview with Sprouse. This special comedy show is for adults only. Doors open at 7 p.m. and the show starts at 8 p.m. on Friday, April 12, and Saturday, April 13, at 35715 Atlantic Avenue, Millville, and runs for about two hours, which includes a 15-minute intermission and a meet-and-greet after the show in the Parlour. Tickets for the comedy improv show cost $20 per person and can be purchased by calling the theater at (302) 829-1071 or online at www.dptmagic.com. Dickens Parlour Theatre presents world-class magicians nightly in-season and on weekends off-season.